Take one big piece of rose quartz rough, eye clean with a slight haze to it. 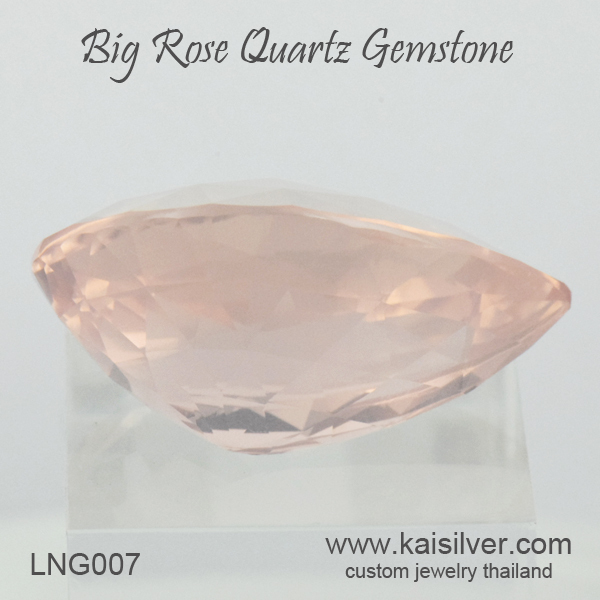 Presuming that you find a rough stone with those qualities in a size of around 200-300 carats, you are on your way to getting a stupendous big rose quartz gem as shown in LNG007. Now begin the cutting process, don't give up easily there will be many broken pieces just keep trying, find another large piece of rough and do it all over again. Depending on your interest, passion and talent, you will finally get the pear shaped rose quartz stone that you desire - 2 to 20 years later! 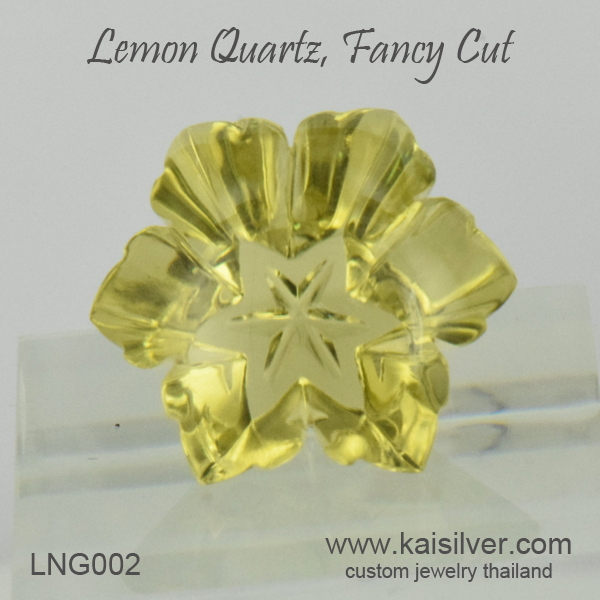 This is no joke, it is precisely how the gem artists who work with Kaisilver learn their skills and deliver those, highly desirable masterpiece gems. 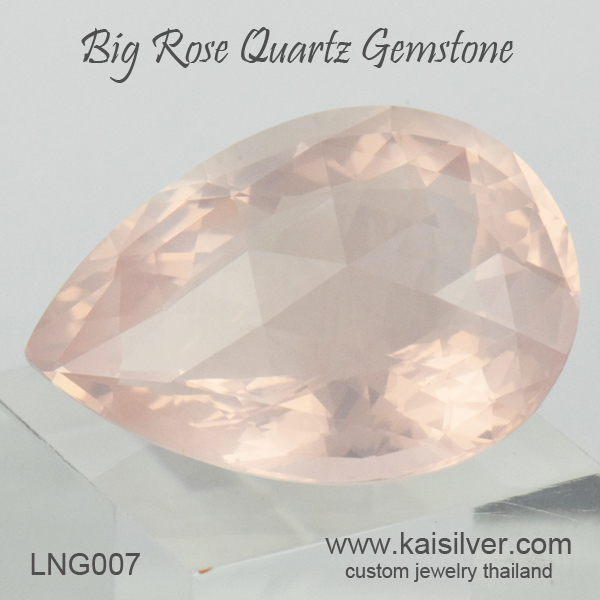 For those of you who happen to be in a hurry and cannot wait for the 'do it yourself' approach explained in the above paragraph, here is the inside story for the LNG007 large rose quartz gem. 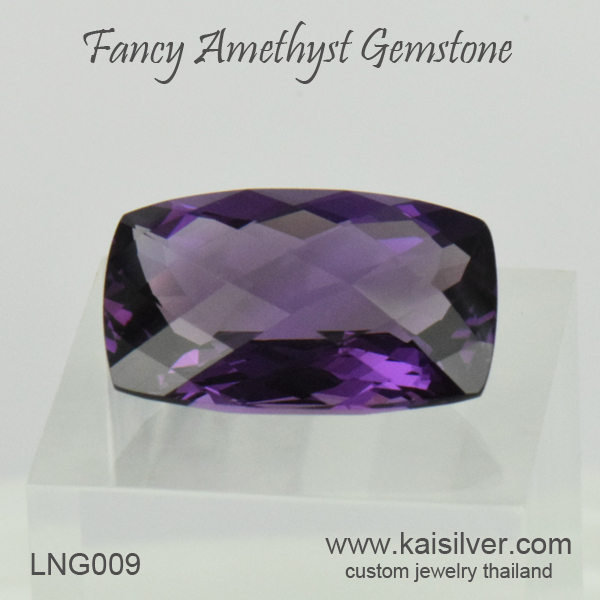 The gem measures 24x17mm and has a depth of 12mm, all these impressive dimensions give it a weight of around 24 carats. The general weight loss from rough to finished and cut stones for this quartz is around 80-85%. This means that the gem artists needs a good piece of rough rose quartz, that weighs a minimum of 200 carats. Rose quartz or what is sometimes known as pink quartz (technically the same mineral and composition) is often found with a heavy dose of inclusions and fissures, this makes most of it useless for doing such fine cutting. Some of the material can be fairly clean but, the very clean gem will hold little light that strikes it - the result is a very pale pink color, sometimes too pale to be noticed or admired. Our large pear shaped checkerboard pink quartz gemstone is generally clean but, shows a slight haze that is uniformly shared across the entire gemstone. The face of the gem is covered with meticulously calculated and angled facets, the result is a spectacular display of light and reflections. Having read the above details and learnt the important features of this gorgeous pear shaped pink quartz, you will agree that the 525 U.S price tag is indeed very reasonable. And if all you need is a bulky rose quartz stone without worrying too much about, quality and cut - there is no need to spend on a fine cut gem like the LNG007. Kaisilver: Generally accepted as the leading online source for fine custom made jewelry, we place no limitation on design and gemstone for the jewelry that you order. By providing equal attention and quality for both gold and sterling silver jewelry, we remain the preferred source for all types of jewelry requirements. While we generally prefer to custom make complete jewelry pieces rather than loose gems, there are times when are are motivated to take up the challenge. Contact us at sales@kaisilver.com with any requirements or questions that you might have, we will be glad to help even if you choose to make no purchase from us.